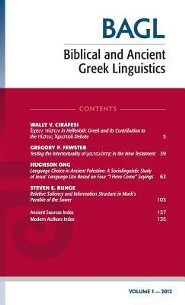 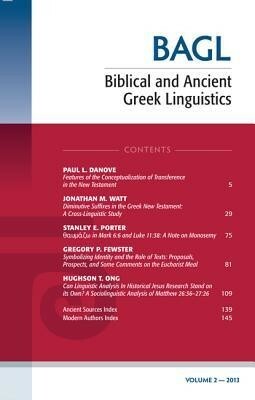 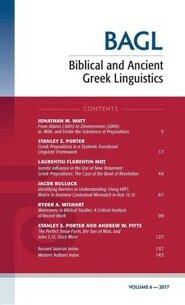 Description: Biblical and Ancient Greek Linguistics (BAGL) is an international journal that exists to further the application of modern linguistics to the study of Ancient and Biblical Greek, with a particular focus on the analysis of texts, including but not restricted to the Greek New Testament. 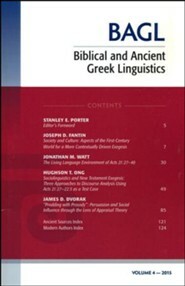 The journal is hosted by McMaster Divinity College and works in conjunction with its Centre for Biblical Linguistics, Translation and Exegesis, and the OpenText.org organization (www.opentext.org) in the sponsoring of conferences and symposia open to scholars and students working in Greek linguistics who are interested in contributing to advancing the discussion and methods of the field of research. 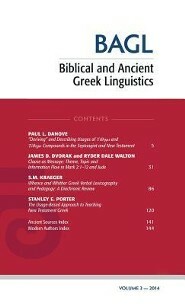 BAGL is a refereed on-line and print journal dedicated to distributing the results of significant research in the area of linguistic theory and application to biblical and ancient Greek, and is open to all scholars, not just those connected to the Centre and the OpenText.org project. 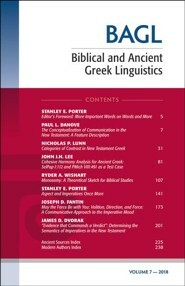 I'm the author/artist and I want to review Biblical and Ancient Greek Linguistics, Volume 2 2013 Edition.